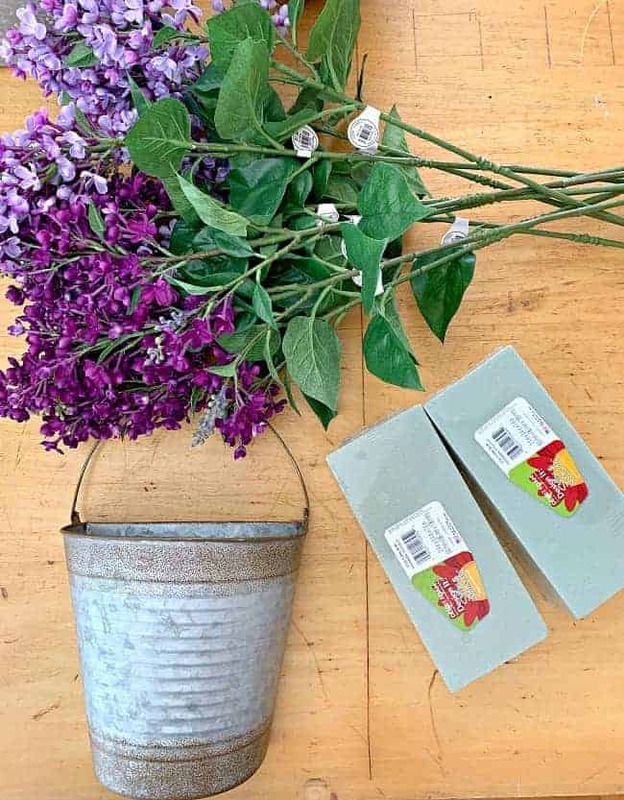 How to make an easy DIY Spring wreath with beautiful lilacs for your front door. I really love the Spring tulip wreath that I made for our front door last year, but I wanted to do something different this year for our sunroom door. I’ve always loved lilacs so that’s what I chose for this year’s creation. 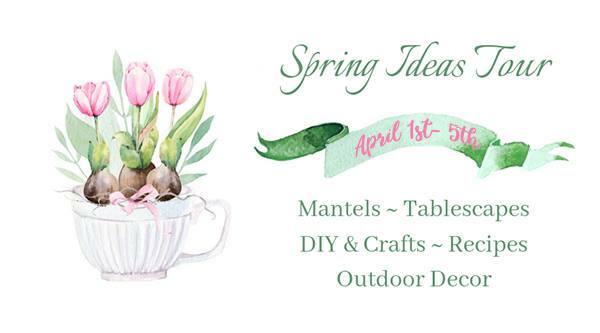 I’m joining in with a group of my blogger friends this week for a Spring Ideas Tour. 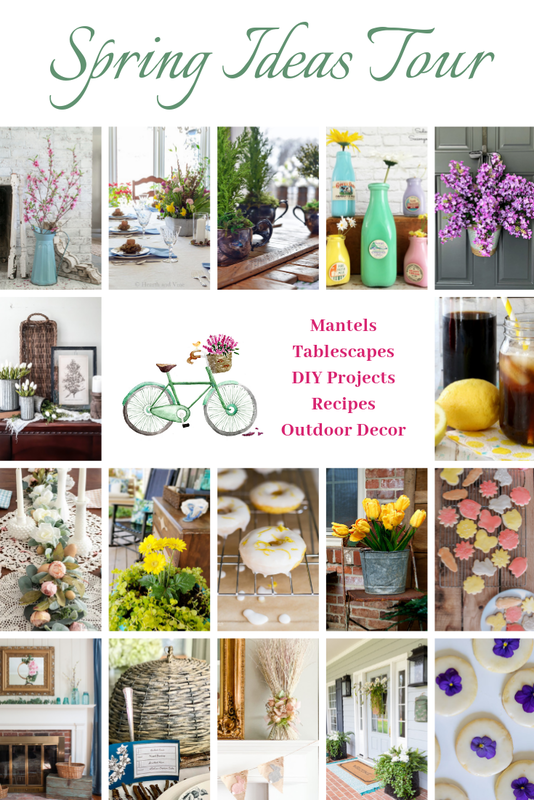 They’ll be sharing everything Spring from mantels to recipes to DIY’s so make sure you check out all of the beautiful inspiration at the bottom of the post. And don’t forget to PIN this post! My earliest memories of my grandmother and grandfather are visiting their house and running outside to their gardens. My grandfather had a wonderful vegetable garden, with everything from beans to tomatoes. He’d walk me around, show me everything he was growing and patiently answer all of my questions. Besides the vegetable garden there were lots of beautiful flowers and a big, gorgeous lilac bush. Ah, that glorious sweet smell in the Spring was something I looked forward to every year. Although I had always wanted one, I never had my own lilac bush until we moved into our house in Illinois. It wasn’t the prettiest looking bush but the smell was there…bringing me back to my grandparent’s yard. 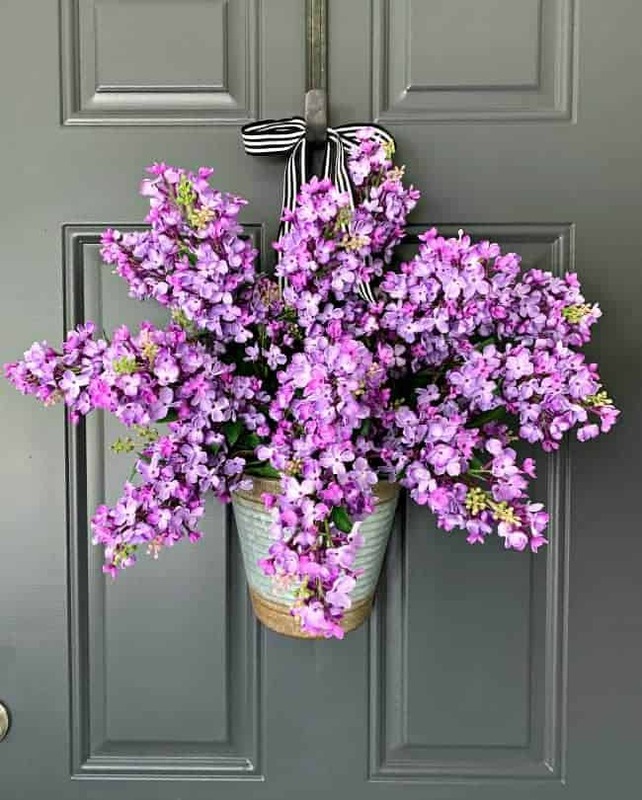 So, with lilacs on the brain this Spring, I decided to make something for my front door to remind me of those wonderful memories. Like all of my wreaths and baskets I’ve made, this one is really easy to do. 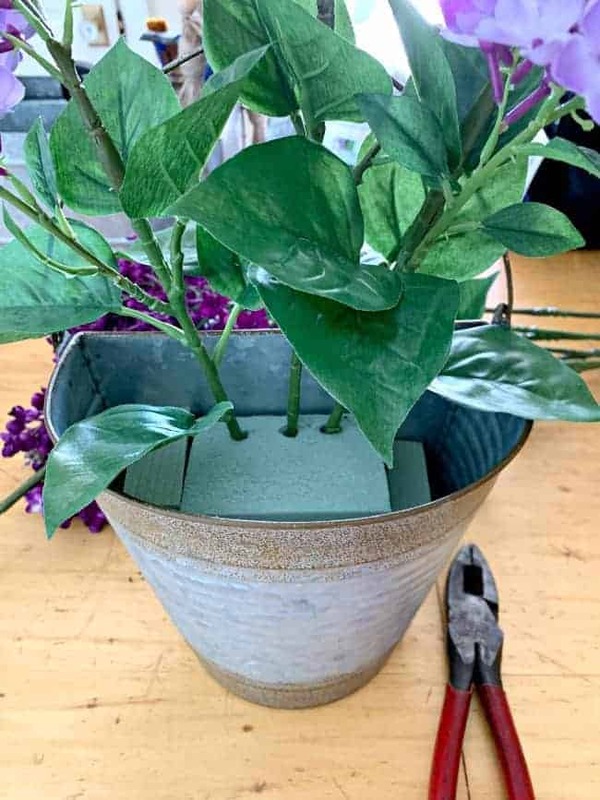 I just used a rusty bucket that I found at Joann Fabrics, a big bunch of lilac stems (the best ones I saw were at Hobby Lobby, and they were 50% off) and a block of floral foam. To begin, I sliced up the floral foam with a sharp knife and fit the pieces snuggly in the bucket. I didn’t worry about filling every nook and cranny, just enough to fit all of my stems (10-11 total, in my case). Next, I started trimming and adding the stems. I started the first row in the back of the bucket and worked my way to the front, bending and twisting the stems to make them look like they were overflowing. The finishing touch was black and white ribbon to hang it up. I found a $1 spool of the perfect ribbon at Dollar Tree so I went with that. 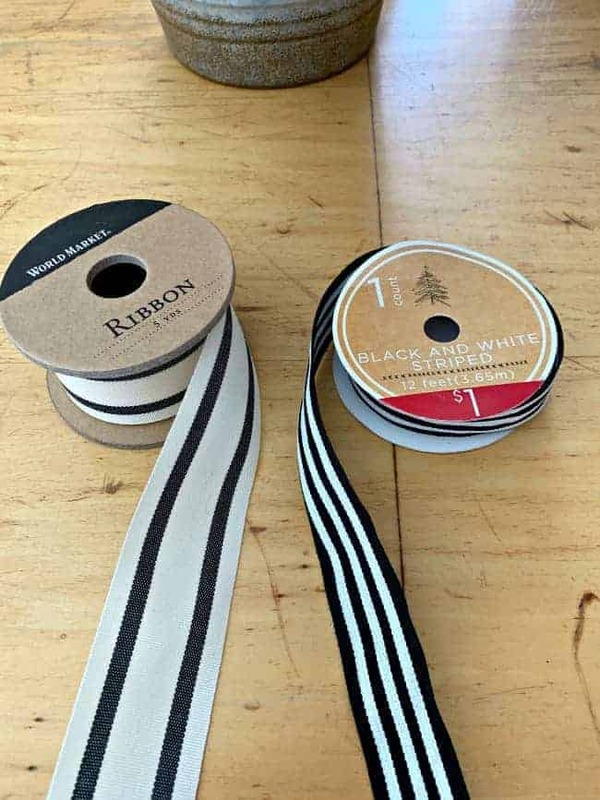 You can’t beat ribbon for a buck! I hung it up on my newly painted front door and then tried it on the door in the sunroom, where it stayed. Now I have the best of both worlds with the tulip wreath greeting us on front door and the new lilac creation in the sunroom. The only thing that would make it better would be to have real lilacs (including that wonderful scent). Either way, I think that my grandmother and grandfather would love it! 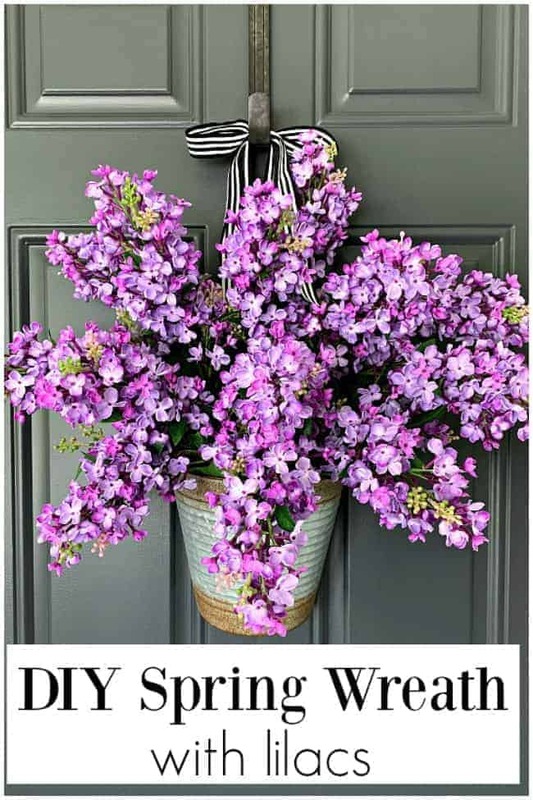 How to make an easy DIY Spring wreath with lilacs to add a touch of Spring color to your front door. 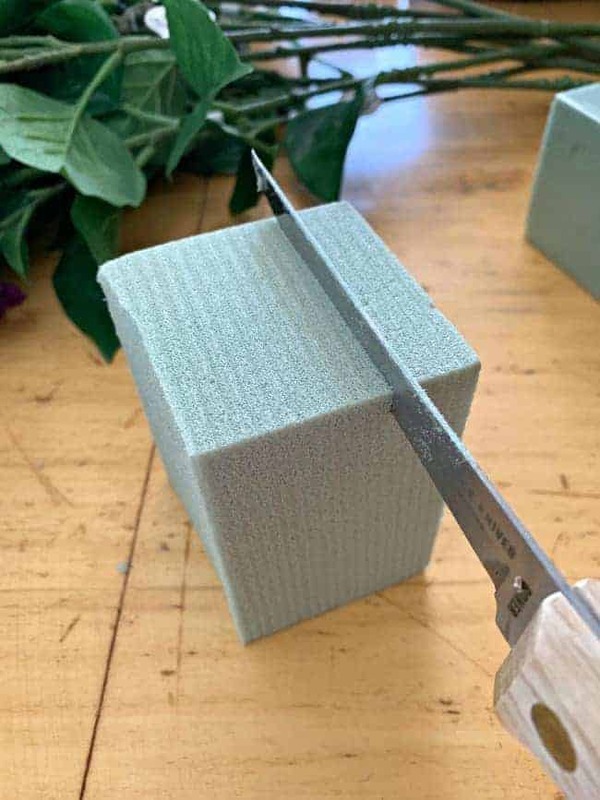 With a sharp knife, cut the floral foam into pieces to fit in the bucket. Fit floral foam into bucket so it's snug. Trim lilac stem with wire cutters, if needed. The number of stems needed will depend on the size of your bucket, and how full you want it to be. I wanted a full look so I used 11. To get more ideas for adding Spring to your home, don’t forget to check out the tour. There lot’s of great inspiration! Well who doesn’t love lilacs? I have my own bush, but doing something like that doesn’t last long enough; beautiful artifical ones are perfect. I subscribed to your blog-is it?-and look forward to more ideas. Those colors are so eye catching and perfect for spring! I love how it looks on your door. We have a lilac bush in our front yard but the flowers don’t seem to last long on it. I am assuming there are different types of lilac bushes because I have seen others that keep their flowers longer. Oh well…I guess that makes me appreciate it while it’s blooming! Ooohhh I love lilacs – perfect for Spring! I’m chomping at the bit to get my home decorated for Spring and this ‘wreath’ just fueled me to get going. Like you, I love lilacs, but don’t have a bush so faux is the next best thing. Thanks for the Spring Inspiration! Thanks so much, Lynn! Yes, I’d rather have real but this is a good substitute. Happy Spring to you! I love lilacs! Now I need to make this! 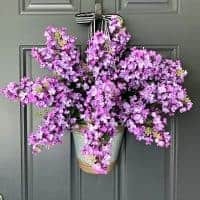 Well now you will never need to make another spring wreath because the two you have (tulip and lilac) are absolutely fabulous and perfect for the season. I wish I could print the picture of the wreath for framing. I made a lilac wreath many years ago but it wasn’t any where near as gorgeous as yours. So sweet, thanks so much Lisa! I love how it turned out and I’m glad that I can use both the tulip and lilac wreath. I’m sure your wreath looked fabulous! You can never go wrong with lilacs. 🙂 Happy Spring! Your wreath is so beautiful Kristi and I do love it on both doors too! I am in love with the turquoise blue on the front door, it is gorgeous! Funny, I have the same childhood memories from my grandparents home, which later became my childhood home. Several years ago, I purchased 2 lilac bushes called” Lil Kim” Lilacs which have done very well in our yard and remind me of my childhood home and my grandparents! Happy Spring my friend! Thanks for stopping by. Love your lilacs on your door they are so pretty. My parents had beautiful bushes to and i have one but, i don’t think mine will ever measure up to there’s. This looks great in your bright blue door! I think I need to head to Joanne’s for a bucket and make one! Thanks so much, Leen! Happy Spring! 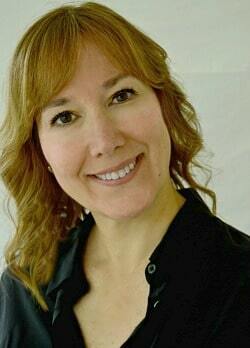 Kristi, So pretty! I love lilacs, too. I’ve planted a couple bushes in our yard, but they’re just not as hardy as the old variety. Your fake ones look amazing, and love them in the galvanized container. Looks great on the black or blue door. Love the extra bolt of the black and white ribbon too. Great hopping with you! Thanks so much, Lora! It’s so nice to hear from others who really love lilacs, too. like your lilac door decoration. I too have fond childhood memories of lilacs and their smell . When my oldest son died (age 20), friends gave us a gift certificate to a local nursery. I chose two lilac bushes, and put them in our yard so that they can be seen from our kitchen window. We refer to these bushes as “Bryan’s bushes” and love when they start blooming – like a love hello from him. I’m so sorry for your loss, Jan, and thank you for sharing the special and beautiful way you remember your son. Oooh. This is so pretty! I adore lilacs and they look great in that metal bucket. The ribbon is the perfect way to finish it off too. Thanks for sharing how you made it and for joining the tour! Thanks so much, Angie! And thank you for putting together this awesome tour! I’ve been enjoying all of the beautiful Spring inspo all week. I’ve always loved lilacs!!! Your spring door idea is awesome !!!! Thanks so much, Terri, I appreciate it! So pretty…a trip to joann’s is in my future! I remember playing under our large lilac tree growing up, love the scent . We have five large bushes here in white and varying shade of purple. One of my favorites, but fleeting. It is fleeting, Jillian. Love them while they last though. Thanks so much for stopping by and for sharing your childhood memories of lilacs. It seems like there are so many of us with fond memories. Beautiful wreath Kristi. My grandparents had a lilac bush on either side of the gate leading to the garden, When they bloomed I knew summer was coming. I miss that sign of Spring here in Florida. Nothing says spring like Lilacs! My grandparents had a yard filled with them and I loved visiting in the spring to enjoy the different varieties and especially enjoy their heavenly smell. 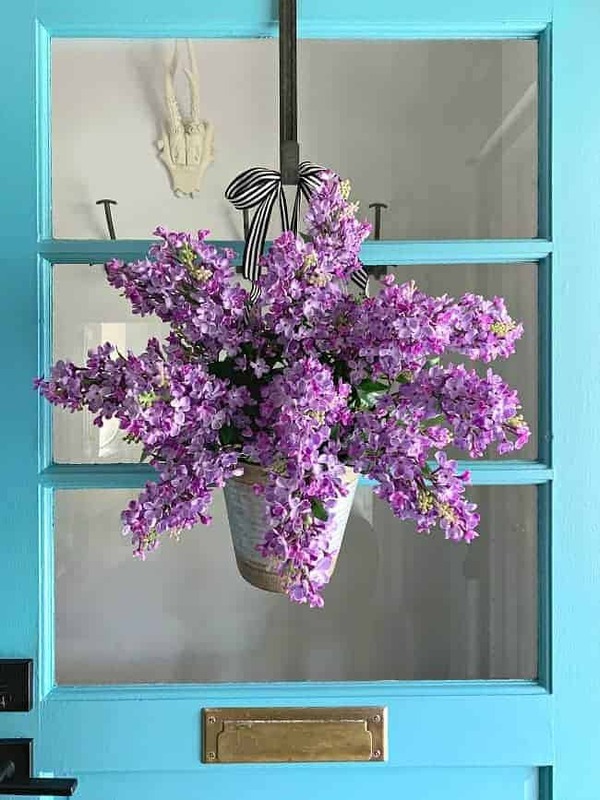 Your door looks beautiful with the lilac arrangement that you created. I agree, Paula! Spring just isn’t the same without lilacs. Thanks so much! You have a talent for making these wreaths—this is beautiful. Looks like a star. Also gives you the benefit of enjoying lilacs without the allergy symptoms that come along with the real thing. Enjoy you flower creations. Beautiful! Looks great against the blue door. Your faux bunch looks so real. I can almost smell them.